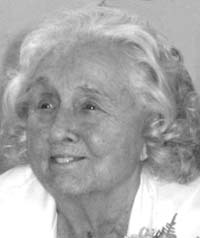 Anna Faye O’Donnell, 92, died Oct. 2, 2013, at Bridgeview nursing center in Twin Falls. Anna Faye Rooker was born in Jerome, Idaho, on May 10, 1921, the youngest of five children of James W. and Martha J. Rooker. Her father was a farmer; she grew up on the family farm just a few miles outside of Jerome, and then on the Broadford Road farm near Bellevue. She attended elementary school and began high school in Jerome, then transferred to Bellevue High School midway through her freshman year when her family moved to Bellevue. She graduated from Bellevue High School with the Class of 1939. Shortly after graduating from high school, she married John S. (Jack) O’Donnell. They built a home on Main Street in Bellevue. While her children were young she remained a homemaker, and did not work outside the home. She was active in the Parent Teachers’ Association and in community affairs. She was a 4-H leader, an LDS primary teacher and an active supporter of Bellevue School sport teams. She regularly helped organize and cater the annual Bellevue July Picnics, and was a key volunteer leader organizing the servers for the Bellevue Labor Day celebrations. In the 1960s, she became a cook, then head cook, in the school lunch programs in Bellevue and Hailey. In 1975, shortly after the death of her husband, she became supervisor of all of the Blaine County school lunch programs. She held that position for almost 20 years. Also in the mid-1960s, she became the Bellevue city clerk, and held that position for more than 30 years, working for several mayors and city councils. In the 1990s, the City Council recognized her many years of service to Bellevue by naming the newly created park in the northeast part of town the Anna Faye O’Donnell Park. For many years prior to that park being built, the basketball court in her front yard was a place of fun for the youth of Bellevue. It gave her great pleasure for young people to have places to play sports and to have her name associated with the park. In the spring of 2008, she was honored by her selection as the Bellevue representative to the Blaine County Historical Society’s Heritage Court. She was a lifelong member of the LDS Church, an affiliation that she inherited from her parents, who were devout members of the church. They took pride in a nugget of family history that as a small girl, her great-grandmother and her family were in the party that came west with Brigham Young on the trip across the plains to settle in Utah. Anna Faye lived in Bellevue from 1936 until 2007, when she moved to assisted-living facilities in Twin Falls. Anna Faye was predeceased by her husband, her parents, her three brothers and a sister, and a grandson. She leaves behind three children, John R. (Violet) O’Donnell of Groton, Mass. ; James A. (Jean) O’Donnell of Gilbert, Ariz.; and Mary R. Eskridge of Twin Falls, Idaho; seven grandchildren; and 15 great-grandchildren. Anna Faye was a wonderful woman, mother, and friend who will be well remembered and missed. Wood River Chapel will coordinate services scheduled for Thursday, Oct 17, 2013, at Hailey LDS Church at 10 a.m. Burial will follow at Bellevue Cemetery. In lieu of flowers, please send a memorial to a charity of your choice in her name. Friends are invited to leave a condolence, share memories and light a candle at www.woodriverchapel.com.